Riveting and disquieting, After Anna is a groundbreaking domestic thriller, as well as a novel of emotional justice and legal intrigue. New York Times bestselling author Lisa Scottoline keeps readers on their toes until the final shocking page. 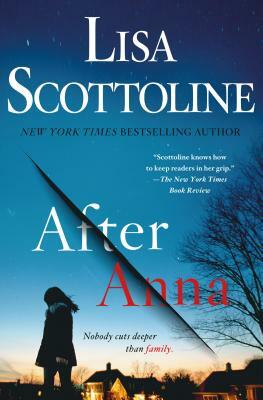 Maggie and Noah know that having Anna around will change their lives, but they would never have guessed that everything would go wrong, and so quickly. Anna turns out to be a gorgeous seventeen-year-old who balks at living under their rules, though Maggie, ecstatic to have her daughter back, ignores the red flags that hint at the trouble brewing in a once-perfect marriage and home. Events take a heartbreaking turn when Anna is murdered and Noah is accused and tried for the heinous crime. Maggie must face not only the devastation of losing her daughter, but the realization that Anna's murder may have been at the hands of a husband she loves. In the wake of this tragedy, new information drives Maggie to search for the truth, leading her to discover something darker than she could have ever imagined. Lisa Scottoline is the New York Times bestselling author of novels including Look Again, Lady Killer, Think Twice, Save Me and Everywhere That Mary Went. She also writes a weekly column, “Chick Wit,” with her daughter Francesca Serritella, for The Philadelphia Inquirer. The columns have been collected in Why My Third Husband Will Be a Dog and My Nest Isn’t Empty, It Just Has More Closet Space. She has won an Edgar® Award and Cosmopolitan magazine’s “Fun Fearless Fiction” Award, and she is the president of Mystery Writers of America. She teaches a course on justice and fiction at the University of Pennsylvania Law School, her alma mater. She lives in the Philadelphia area.